When Tommy Tomlinson was nearing 50 years old, he weighed in at an astonishing 460 pounds. So began his quest to lose weight. 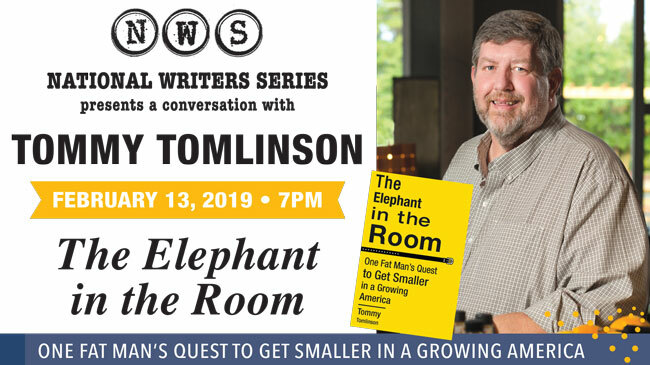 An acclaimed journalist, Tomlinson will talk about his new memoir, The Elephant in the Room, which explores what it’s like to live as a fat man and how our country arrived at its plus-size epidemic. His book resonates with anyone who has struggled with addiction and shame. This event was made possible by Event Sponsor: TBA; Sustaining Sponsor: Cordia; Season Sponsor: Boomerang Catapult; Grantors: Michigan Council for Arts and Cultural Affairs, National Endowment for the Arts; Media Sponsors: Midwest Broadcasting Co., Traverse City Record-Eagle, Northern Express, Interlochen Public Radio, Up North Media, WNMC.